A military parade involving some 8,000 warfighters and combat vehicles in a new, digitised camouflage pattern will be held next Saturday (21 September 2013) in the heart of the Malaysian capital, Kuala Lumpur. Held to mark the 80th Anniversary of the Malaysian Armed Forces (Angkatan Tentera Malaysia) on the first weekend after Hari Angkatan Tentera (Malaysian Armed Forces Day on 16 September), the tri-Service event promises to be bigger than the Malaysian Army Day parade held earlier this year in Port Dickson. The parade is expected to march off from 8am on Saturday 21 September, with ATM battalions led by their own military bands. Thousands of troops will be trailed closely by a Mobile Column comprising a sizeable number of ATM war machines. The ground elements will be crowned by a low level flypast of Royal Malaysian Air Force warplanes and Royal Malaysian Navy helicopters. Spectators will be treated to a static display of ATM equipment after the parade is over. With a week to go before showtime, Malaysian defence enthusiasts are abuzz about new equipment that their country's armed forces may display for the first time. An image of an Adnan infantry fighting vehicle in fresh warpaint has been circulating among Malaysian military enthusiasts on the MyMil website. This shows a vehicle painted in a four colour camouflage scheme that appears to be an upsized version of the new ATM Number 5 camouflage uniform. The colours used appear to be the same as those found on the current Harimau (Tiger stripe) pattern. The new No. 5 is expected to make its debut next Saturday when the parade marches off at Merdeka Square in KL. More information on the ATM 80th Anniversary Parade will be released from this weekend onwards after Malaysia's PAT chairs a press conference. The newsflow is timed to build up awareness and anticipation of the Malaysian military's biggest show of force in years. This blog will be in Kuala Lumpur next week to celebrate the occasion with the ATM fan club. 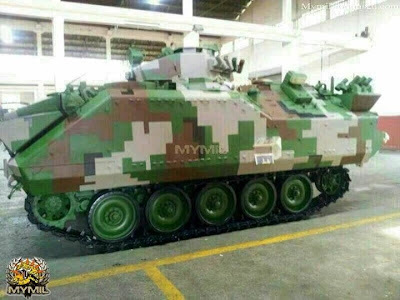 With grateful thanks to Kuala Lumpur-based defence journalist Dzirhan Mahadzir for keeping us in the picture and Malaysian military enthusiasts from the Mymil forum for images of the new camouflage patterns. Ta'at Setia! This would make it the 3rd camouflage change in 20 years. Hmmm and I still think that the one they had in the 80s were still the best in terms of camouflage in the jungle. However, veterans that I know from the Emergency still swear by the olive green camouflage that they used in the 50s and 60s. They said that those worked damn well in the jungle without any fancy disruptive patters or anything like that. Just plain old green. Than they roll up their killer point. We are still alive, despite surviving ambushes and firefights! But that was probably tall tales exaggeration. By the way, how about seeing if readers here can meet up in KL for the Malaysian military extravaganza at Dataran Merdeka? I'm planning to go up to see it and it would be great to see it with like minded enthusiasts. Taat Setia is the motto of the RMR. That of the army is Gagah Setia. Yes, am aware. Used it as a kicker as I love the motto. 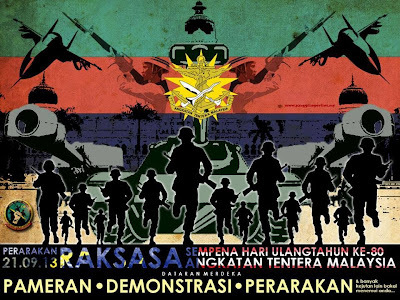 The motto Gagah Setia, mentioned at the start of the Malaysian Army Day parade in Port Dickson, was positively stirring when followed immediately by the parade. This is the 2nd new cammo pattern in 20 years, not the 3rd. The 'harimau belang' pattern was officialy introduced in 1993 at Ex-Halilinter in Langkawi, prior to that the 'brushstroke' [similar to the Rhodesian pattern] pattern was in use since the late 1970's. Help me out please. What arm is represented by the beret colour that the Malaysian CDF is wearing? So when most countries are moving away from digicam patterns Malaysia goes and develops/purchases their own. Interestingly the picture shown has beltkit on what could be an ALICE style belt. Strange when the recently purchased body armour is MOLLE. The Malaysian body armour is only for infantry, other soldiers will use this webbing. 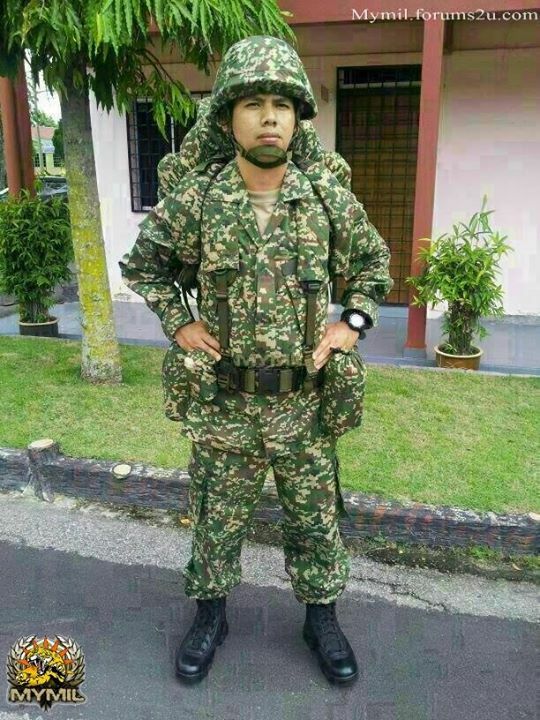 Not like Singapore's vest which is for all soldiers but with plates for infantry only.